Pound for pound, the amoeba is the most vicious predator on Earth! Most games put up on Kickstarter to date have not impressed me. Only two have been sufficiently interesting to cause me to actually support them, and one of those was the reprint of Glory to Rome, which is a tried and tested game that I have played numerous times before. 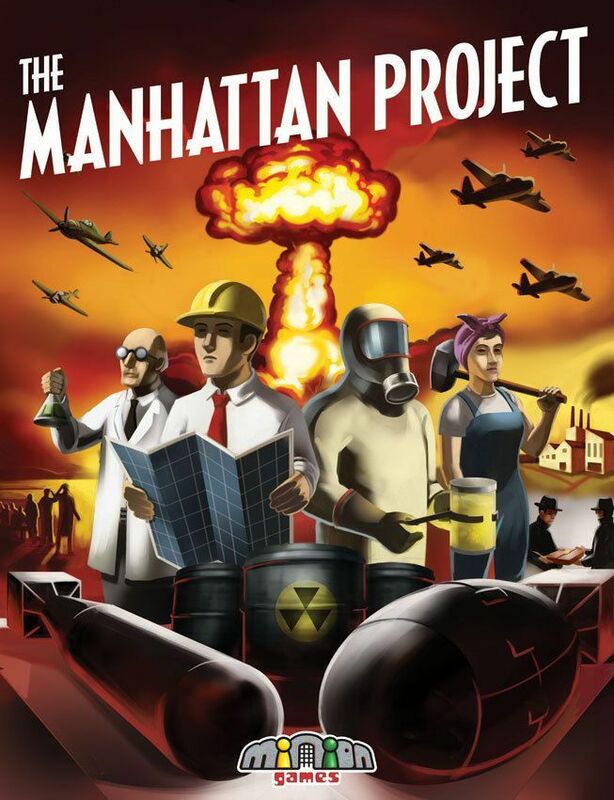 The other game, the one that I am talking about today is the Manhattan Project, a worker placement game published by Minion Games and designed by Brandon Tibbetts, a name I was previously unfamiliar with. The reasons for this were twofold: the first was that I found the game to be thematically appealing and the second is that I have an inescapable attraction to heavier worker placement games. Reading the rulebook indicated that the game had some mechanically interesting aspects and the combination of the two was enough to push me over the edge into supporting it. For a smaller publisher Minion Games has done a phenomenal job on their components in general and graphic design in particular. It may, in fact be one of my favorite graphic designs period, marred only by all too typical color issues. The first excellent choice comes in the form of board size. While it would have been very easy for them to make the cards and workers unnecessarily large and increase the size of the board to the point where it is equivalent to that of most euro-games they instead used smaller, but still clear, cards and decreased the board size such that it will fit even on smaller or narrower tables. While I have no problem with a larger board, if it is useful or necessary, I appreciate the fact they were willing to go smaller; I am sure it will help keep down the cost for the final retail price of the game too. 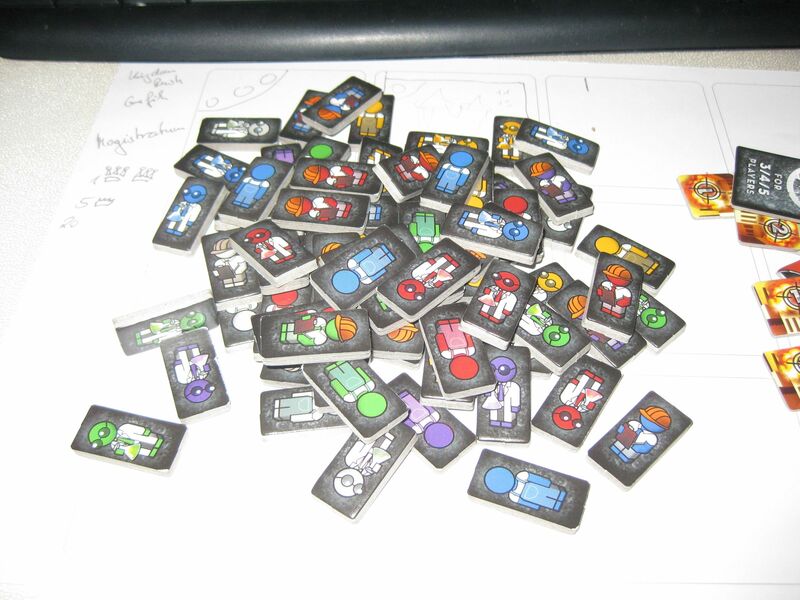 The cardboard components are also very good, with the workers counters being extra thick and everything else being of suitably sturdy construction. I was mildly disappointed at first that we did not get wooden workers (meeples!) but that disappointment quickly passed, as they would not have been able to accomplish what they did graphically with wood. 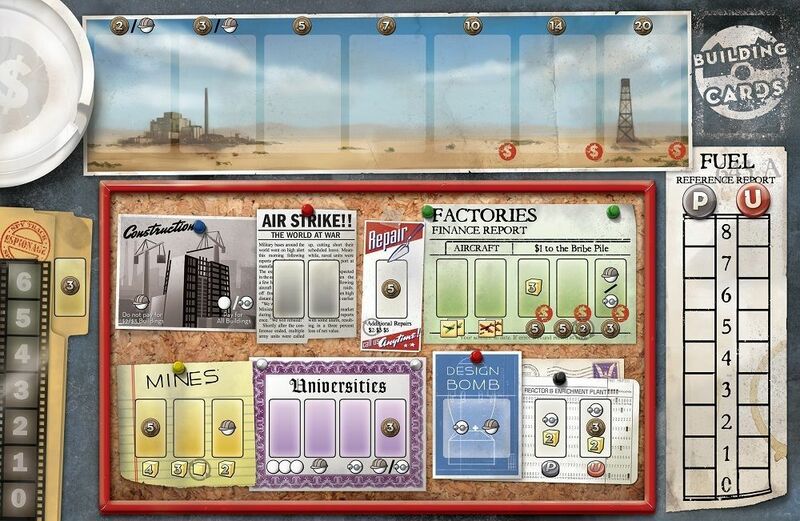 The second truly excellent choice they made for The Manhattan Project was in the overall art and style of the game. It is very evocative, bringing to mind 1940’s era propaganda posters highlighting the industrial and research capabilities of the nations involved or perhaps the Fallout series of video games. The artwork for the worker themselves is cartoonish, but pleasantly so. Each one has full and easily identifiable clothing but lack physically features making it easy to imagine the individual workers as members of any particular nation. This freshness in the face of high-quality but graphically unimaginative styles of many other games is enough to really cause this game to stand out. Unfortunately, the Manhattan Project, like many other games, will cause issues for those who are red-green colorblind. However one of the typical problem pairs, red and green, are not an issue for me with the Manhattan Project; I had very little difficulty telling them apart. The purple and blue however, were pretty tough to distinguish, but the design of the game is such that it resulted in very little game state confusion, as I only had to occasionally ask which color was which in order to identify how much uranium or plutonium a player had. Still considering the number of other color options that are easier to distinguish it is a shame that they had to go with two colors that are easily confused. On a player’s turn they may either lay a single worker down on the main board and any number of workers on their personal boards or they may recover all of their workers. As this general structure implies, tempo management is the key to The Manhattan Project, and while tempo management is important to many other worker placement games, I am not quite sure I have ever seen its importance be on quite the same scale. Other things are important in the game, and there are plenty of interesting decisions that do not involve when you are going to place vs. recall your workers, but most of them directly affect or are affected by that decision. Two prime examples of this are some of the more interactive elements of the game: bombing strikes and espionage. Since the game is set at a period when most of the world is at war, it is possible to use fighters to destroy other player’s fighters and then launch bombing strikes at the target players’ undefended buildings. Do these attacks permanently destroy the targets buildings? No, instead they damage the building requiring both actions and money to replace, thus requiring them to slow down their own momentum in order to regain access to their buildings or construct alternate paths to the games ultimate victory condition: setting off atomic bombs. Similarly the espionage action lets you accelerate your own momentum at a cost to other people. It is the only action on the board that lets you use, and thus block off, other people’s buildings and give you access to capabilities that you do not currently have for yourself. This is such a momentum enhancer for you, and a drain on other players that once an engine gets running it is typical to see the espionage passed from player to player, as individuals start to see it as being too powerful to let one player get twice in a row. It also tends to be more commonly used than air strikes, at least in our games. Espionage will usually directly benefit you, air strikes may not. The bomb cards are another aspect that highlights the centrality that tempo management has in The Manhattan Project. The Manhattan Project’s end condition is hitting a victory point threshold that varies depending on the number of players. In order for bomb cards to enter the game, a player needs to take an action that gives them two bombs, their first choice and whatever is left over after all of the other players have picked one of the bombs. So it is quite possible for you to get the bomb cards you need without ever taking a main board action to do so, but only at the cost of having a lower degree of control over which bomb card you can get. Since there are usually multiple ways to get to the required victory points, it seems like it would be possible to win the game without ever taking the action, and thus the momentum hit, but having control over your victory point sources seems strong enough that this will probably only happen rarely. The available buildings are based on a card draw and generally perform the same function as those on the main board, with anywhere from a slight to large increase in overall efficiency. The variable power of these buildings is based on two factors. The first of these is that, much like Through the Ages, buildings are more expensive when they first come out but become increasingly less so as earlier buildings are constructed, so if you want to have a particularly powerful building you may have to pay a large amount of money for it. The second mitigating factor is the previously mentioned espionage action. If you get a building that is particularly desirable then you will find that other players use it for espionage almost every time they get an opportunity, meaning that you may end up paying a great deal of money for a building that is used by other players more than yourself. All but one of the initial buildings are seeded, but after that there is no particular order in which they come out. This can result in some interesting streaks, as there can be a low number of buildings that produce money, yellowcake, or uranium and plutonium. This variability in the emerging buildings, and who gets the more scarce buildings results in some fairly interesting dynamics. First of all can increase the value of the board spots that produce these resources, making it so spots that are normally taken only occasionally suddenly become much more valuable, and it makes it so whomever does have buildings that produce the desired resources will become a much more frequent espionage target, decreasing the value of the building for that player. Being able to gauge when it is important to start taking advantage of the generally available locations for these materials rather than hoping the correct building comes out is an important skill in the Manhattan Project. So what sort of things are you doing with your workers besides spying on each other, bombing each other, and constructing buildings? Mostly they serve to produce and convert resources as is typical in eurogames. The primary resource of the Manhattan Project is those previously mentioned workers (engineers, laborers, and scientists) that are produced by universities. You start the game with four laborers, and can gain up to four more permanent engineers and scientists throughout the game. Additionally, players can gain up to four of each of the temporary versions of the permanent workers, from a common pool, ensuring that universities can continue to be useful after a certain point and allowing you to perform various tempo enhancing or sapping maneuvers based on manipulation of the presence of these temporary workers in the supply. Each building requires the use of a different combination of quantity and type of workers, meaning that it is important your tailor your worker configuration to the requirements of your buildings. Doing otherwise can reduce your ability to use your own buildings, which may be acceptable based on how disrupted other player’s tempos are, but can be ensure your defeat otherwise. The next type of building is factories, which produce some combination of money, bombers, and fighters. Money is probably the most generally useful of these items because of the flexibility it provides; it lets you use the espionage buildings, buy buildings that are not available with just an engineer , or allow you to access actions that require money. One of the two types of nuclear fuel, uranium, is also very expensive and it can be difficult to set up an efficient way to get uranium unless you effectively manage your money. Fighters are used exclusively for stripping away other player’s defenses in order to be able to open them up for bombing runs, but bombers have an additional use beyond damaging buildings; they can be combined with money to provide a 5 point bump in the value of any given bomb when you detonate it. Mines are probably the most straightforward of the buildings, as they simply produce variable quantities of yellowcake, which is the basis for producing both uranium and plutonium. There are certainly some mines that are more efficient than others, but the bigger ones are particularly useful in that they produce large quantities of yellowcake while also sucking up your workers, allowing you to use your workers more efficiently without damaging your tempo. Of course the ones that require smaller amounts of workers are good, because you can always used them and they are thus much more flexible to changing game state and are much less likely to be used by players taking advantage of the espionage action. Enrichment Plants and Reactors allow for the production of uranium and plutonium, turning large amounts of yellowcake into plutonium, or smaller amounts of yellowcake and money into uranium, or turning yellowcake or uranium into plutonium. The shortness of the overall resource conversion chains allow for a great deal of flexibility in getting the right combination of victory points to win; it is very possible to switch between Uranium and Plutonium bombs in the middle of the game if necessary, particularly if you think that the costs of taking another design bomb action are not worth the potential risks of one of the other players to get designs on their own. On the whole I like The Manhattan Project, but I see a few ways that it could potentially end up not working in the end, both for me and for others. I do not think any of these are truly fatal flaws, but they do keep them The Manhattan Project in my second tier of worker placement games (Caylus, Dungeon Petz, Key Market, or Le Havre) rather than my top tier (Agricola, Dominant Species, and Ora et Labora). My biggest problem with The Manhattan Project is how incredibly focused the design is. There are no enjoyable explorations of the various different ways to win. With my favorite worker placement games the design is broad enough that there are usually numerous different ways where I can attempt to manipulate the system in order to try to win. The Manhattan Project is much more focused than that, and while there are plenty of different ways you can get to the victory condition, the game’s overall focus on tempo management is such that most such items directly feed into that. This lack of strategic variability is somewhat disappointing, but not ultimately something I can really hold against the game too much. It accomplishes its objectives very well, and should work very well for those who like very focused designs. As it is I still enjoy it and appreciate its uniqueness in my collection, I just am concerned that after 20 or 30 plays I may grow to tire of it. The game is interactive enough that an inexperienced player among those who are more seasoned can disrupt The Manhattan Project’s play experience. Because of how focused the game is on tempo and the ease in which players can effect others tempo either indirectly, through leaving actions open that they should not have, or more directly through air strikes or espionage, there is great potential for those who are less experienced at the game or who are unable to maintain the required amount of attention to disrupt the game and throw it to one player or another. The fairly strong left-right binding is a secondary contributing factor to this, as someone to the immediate left of a player who makes a mistake will usually be the one to benefit from it. There is some potential for the luck of the card draw, mostly from the bomb deck but also from the building queue, in having a negative impact on your ability to win. Being able to gain victory in fewer bombs is usually worthwhile, and it is possible that revealed bombs could leave you without any viable alternatives, particularly if you choose to specialize early in either Plutonium or Uranium production. However, I think a lot of this can be resolved by choices in the game. Taking the design bomb action rather than just waiting for whatever comes to you can help ensure you get the bombs you need, and waiting to produce uranium or plutonium until after you have your path to victory can mitigate the potential for the wrong bomb types coming out after you have produced your material; of course someone who is willing to take a slight chance in this regard might end up beating you anyway, but making these sort of judgment calls is simply part of the game. The play time of The Manhattan Project can potentially drag if people are particularly slow in their decision making or if enough reactors/enrichment plans do not come out. There seems to be a significant enough numbers of these buildings to prevent this from occurring, however, and players can resolve this lack by simply buying more buildings, and thus pushing out new buildings at a faster rate. My games, even with new players, have generally lasted 70 to 90 minutes, and the Manhattan Project is one of the few games where the time listed on the box is a conservative estimate. I suspect that if The Manhattan Project lasted much more than 120 minutes I would find it less entertaining. I like the Manhattan Project and am pleased that I chose to back it. While it is a very tempo focused game, it is short enough and is nuanced enough within that focus that I think it is definitely worth owning, if only to explore the limits of the entertaining system that Mr. Tibbetts has put together. While it is not my favorite worker placement game, it is still a good one, and one that I can definitely recommend both for fans of more interactive worker placement games and people who like games focused on tempo management in general. In the interest of disclosure, while I did Kickstart the game I was also sent an early, extra copy in order to do this review. I ended up giving this extra copy to someone in my game group who wanted it. Great review. Very interested in seeing this one. Presentation looks amazing. Worker placement is my favorite game mechanic. Mr. Dean is becoming my favorite reviewer. Game added to my wishlist! Can you order from Brave New World in Germany? There are distributors that will have copies in your area (world wide)... It just might take till end of March for them to see them. I only hope to get 20-30 plays of a game in. Excellent review. They should, but it always helps if you nag them. Do you see Kingdom of Solomon on their lists? Another great game and that was officially release on 1/23 this year. They should be carrying it. We need the help of fans to help make stores and thus distributors aware of the products so they order from our fulfillment company in the states. As for Brave New World, I think you can call them on the phone or email them in English. Still waiting on our shipment which is a month out.